East Java is a province in the eastern tip of the island of Java, where most of the population is still very preserving culture and Java. The Javanese are famous for their friendly and courteous personalities. Not just their personality, they also have a history of tradition and culture that is very attractive. Examples such as dance, food, music, even up to traditional ceremonies. The ceremony is a ritual performed jointly that still has ethnic, tribal, and cultural links. On the island of Java there are some traditional ceremonies that are quite unique and should be introduced to the young generation so that the ancestral heritage remains sustainable and awake. Here are the list of traditional Ceremony in East Java you should know. Kasada Ceremony is the Tengger Tribe’s customary festival held every 14th day in the month of Kasada in Javanese calendar. In Ceremony Kasada, Tengger throws various offerings of vegetables, fruits, cattle and even money to the crater of Mount Bromo. The Tenggerese are themselves adherents of the old Hindu religion. Unlike other Hindus worshiping in the temples, the Tengger Tribe performs worship in punden, danyang and poten. Kasada ceremony conducted Tengger Tribe as a form of gratitude for livestock and agricultural products are abundant, begging to be kept away from the catastrophe, and the main one is as a warning sacrifice Raden Kesuma, children Jaka Seger and Lara Anteng, rulers Tengger tribe in ancient times. In Kasada ceremony, Tengger Tribe people gathered with the produce of farms and farms arranged in a place called ongkek. They flocked to bring this offering to the crater of Mount Bromo to be thrown into it. Ngliyep beach every in every Maulud mounth (javanese calendar) must be held labuhan ceremony to give offerings to the southern invisible Queen of the sea, Kanjeng Ratu Kidul or Nyai Roro Kidul. This beach is located in the village Kedungsalam Donomulyo district which is located about 80 km south of the city of Malang and is the district of Malang, East Java. The ceremony aims to keep the fishermen safe from the ferocity of the south coast waves and ask for blessings by offering tribute to the magical ruler in accordance with the beliefs of the local community. This tradition has been going on for hundreds of years, although it was not as big as it is today. Overall Labuhan tradition has a meaning to seek salvation for the people by doing the tradition. It is also as an expression of gratitude for the granting of salvation and as a form of sacrificial tradition to Nyai Roro Kidul, the ruler of the southern sea that is dimitoskan by community supporters. Seblang Ritual is one of the ritual of Using society which can only be found in two villages of Banyuwangi, namely Bakungan village and Bysari village. 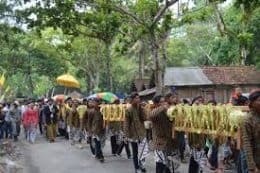 Seblang or Sebele ilang (the missing of hate) This ritual is carried out for clean village purposes and reject the reinforcements, so that the village remains in a safe and peaceful. The implementation of the Seblang traditional dance in the two villages is also different in time, in the village of Bysari held one week after Idul Fitri, while in Bakungan village held a week after Eid al-Adha. The dancers were chosen supernaturally by local shamans, and dancers usually have to be selected from the descendants of theprevious dancers of seblang. Kebo-Keboan is one of the ceremonies held by Banyuwangi community. Early on, the ceremony was held to beg for rainfall during the long dry season and as a repellent of reinforcements. In this ceremony there are several and interesting attractions to see and become an annual tourist event of Banyuwangi city. A person elected to be a buffalo man in this ceremony should be dressed up like a buffalo (Kebo), which is given horns and black color throughout the body. It symbolizes that buffalo is a strong animal and became the foundation of a livelihood community as farmers. Kebo-keboan is practiced in almost all of Osing villages in Kecamatan Singojuruh, such as Alasmalang and Aliyan villages. The villagers of Sawoo and Grogol mostly embraced Islam. However, residents in both villages are still performing traditional ceremonies that are not actually included in the teachings of Islam. Residents in both villages all believe there is supernatural powers. This is apparent in some ceremonies that are still being performed today. Primarily agricultural ceremonies, these ceremonies are performed, apart from being a request for protection, also referred to as a thank-you to God Almighty. If the rice field has been done then the seed immediately sown (ngurit). At this time held selamatan with dish of rice such as Golong, Jenang abang, and chicken innards (chicken stomach contents). The purpose of such salvation is that the seeds sown may flourish. After the ceremony ngurit. the next ceremony is at the time of tandur (planting). At the moment there is a simple dish in the form of chocolate that will be placed in the rice field, where the tandur begins. 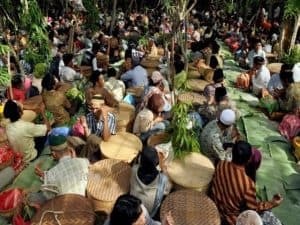 The ceremony ritual “Temanten Kucing” held by the people of Pelem Village, Campurdarat, Tulungagung Regency, East Java, can not be separated from the tradition of their ancestors. 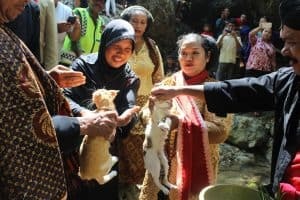 Temanten Kucing is a ritual to marry the male cat and female cat. The purpose of the tradition is to ask for the rain fall when there is a long dry season. Unfortunately, the ritual event “Temanten Kucing” is now not as sacred as similar rituals held in previous years. Ritual event “Temanten Kucing” at this time tend to be more instant. Many of the unique traditions that are part of the “Temanten Kucing” procession are now eliminated. The procession meets the couple “Temanten Kucing” with the reading of prayers followed by a number of village elders. As soon as the prayers are finished, the cat’s bride is finished. So the impression arises, the ritual “Temanten Kucing” tends to be simple and instant. 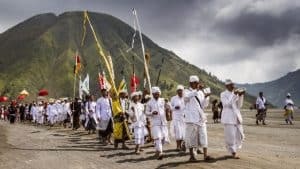 The people of Tengger who live in Mount Bromo area in Probolinggo, East Java have a unique tradition to drive out spirits as well as to save their villages from catastrophe. The ritual that is held every 5 years is known as Unan – Unan ritual which means the refinement of deficiencies or deeds that have been detrimental to life. 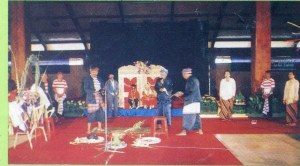 Unan – Unan ritual begins with parading the offerings of buffalo head from the Village Hall Ngadisari, District Sukapura, Probolinggo to the worship studio in place of the founder of the village (punden). 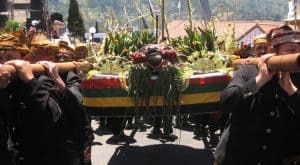 All religious figures, village leaders and Tengger clans of indigenous clans participated in the procession with Javanese gamelan and Reog dance. Prayers and mantras were recited all the way to the worship center. This method is done so that all spirits do not interfere as long as the ritual takes place. Upon arriving, they were worshiped by shaman worshipers and traditional leaders took place to perform the prayers and spell the holy water. The holy water is then sown to all participants of traditional ceremonies, as a symbol of expulsion of the glow of life. Larung Ari – Ari is a procession of traditional ceremonies of melarung (wash away) the ari – ari of the baby known in the city of Surabaya. Ari-ari is the placenta of the baby. It will be washed away along with the 7 different kinds of flowers, kendil, white cloth, and needle into the sea. Larung Ari-ari ceremony is done with the process of singing Macapat song that is Dhandhang Gula. After the event of placenta is completed it will be closed with a party to celebrate the birth of the baby with a festive. Larung ari-ari is indeed still maintained its existence until now. Especially for residents of Surabaya City where there are coastal areas. Komantan Soddu ‘is one of the rural community culture in Bondowoso area, the story of this society culture was originated from the desire of a husband and wife who had many years of gathering but not yet blessed with children. After the wife looks pregnant then the family intends to hold the event (the father and mother agreement). When a baby boy is born the Khitan (Sonnat) will be conducted a party. The child is seated in a cottage called Komantan Sonnat, while the birth of a female child becomes Komantan Soddu ‘performed during the ear prick. This activity is enlivened with entertainment in the form of Horse Kenca ‘(Kuda dance) which is accompanied by kennong tello, it is very interesting because the mantis are on a horse that can dance and paraded around the village. Culture Komantan Soddu ‘is implemented from generation to generation until now. Most people of East Java would still do this ritual for pregnant women. Tingkeban ceremony was held at the time of the womb was seven months, therefore there is also a ceremony called the piton-piton (pitonan). This tingkeban ceremony is only performed by women who are the first time pregnant. In the second, third, fourth pregnancy, no such tingkeban ceremony was held. 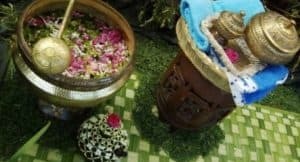 The tingkeban ceremony, consisting of several stages of activity, begins with kenduri, splashes, splits the cup, drops the binoculars, changes in clothing, and ends by selling rujak (hot mixed fruit foods). Those are the traditional ceremony that still exist in East Java. All the traditions above have to be preserved since it is the part of Javanese culture. While you visit East Java, don’t forget to join on of them to be the part of the ceremony too. It would be your great experience ever.